Blade, Finishing Mower, Set 0F 3 New finishing mower blade. Blade measures 2" x 15.343" with. Set of 3 is required for 44 mowers. Fits Kubota lawn & garden tractors. 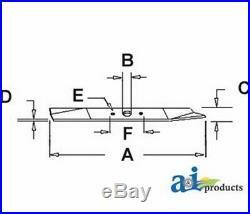 Set of 3 for 44 Cutter Dim G (7): Set Of 3 Blades Hole Diameter. 343" Outer Hole To Outer Hole: 1.500" Overall Length: 15.343 Thickness. 187" Width: 2.000" Kubota Lawn/Garden Tractor G3200 (with RC44-G mower) G4200 (with RC44-G mower) G5200 (with RC44-G mower) G6200 (with RC44-G mower) RC44-G. The item "Blade, Finishing Mower, Set 0F 3 70712-99010" is in sale since Thursday, March 21, 2019. This item is in the category "Business & Industrial\Heavy Equipment, Parts & Attachments\Heavy Equipment Parts & Accessories\Antique & Vintage Equipment Parts". The seller is "justauctions" and is located in Sparta, Michigan. This item can be shipped worldwide.